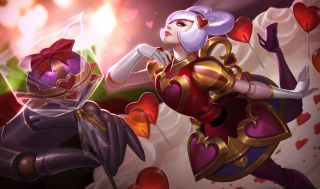 Can League of Legends ever capture the true meaning of love? Riot's got some work to do to turn its champions into characters. Valentine’s Day has come and gone, and everyone’s thinking about love. I’m big into League of Legends lore when they release events and stories, and I’m also the kind of fan who is into the relationships characters build with each other in greater settings. This isn’t just the guilty pleasure of one player, either. League of Legends has a huge fanbase, and translating that fanbase outside of the game itself is part of the Riot mission. They’ve started with board games and alternate universe shorts, but Riot wants to tell bigger stories and play with different media. The ultimate expectation is a League of Legends movie or TV show, but even if that doesn’t pan out, Riot wants to tell League stories. Tragedies, horror, romance, action, politics... All of these are fair game in the League of Legends universe, and all of them have been attempted in some form or another. There’s just one problem: Riot has yet to form some of the compelling, positive bonds between characters (romantic or otherwise) that make a universe feel alive. Sure, a lot of champions are, by nature, asexual, aromantic, or stoic loners. You won’t ever get a story about Kled falling in love, Draven’s close friendship with a comrade, or Amumu’s fulfilling romance. But what about the champions that do have that built into their core? Ashe and Tryndamere are in a political marriage to secure an alliance that could unite the Freljord. Lucian’s wife, Senna, fell to Thresh and his entire life is now built around saving her from his Lantern and eternal torture. Garen has been secretly in love with Katarina from afar for years now. Rumble has a crush on Tristana. Most of these relationships are a couple of quick voice lines or a couple of lines in a bio. Draven’s relationship with Draven is more fleshed out in game than Ashe’s marriage. Lucian’s wife is central to his character but, well, she’s dead—she’s motivation, not a person of her own. For a universe full of incredibly attractive people with strong beliefs, there’s very little passion or friction between any of them. You might expect the universe to turn into an Olympian village sort of situation, but instead, everyone seems largely content to stay to themselves and hunt down their individual nemeses. In fact, conflict, vengeance, war, and other bloody scenarios seems to be the only time when League heroes really get to connect to each other. Leona and Diana are at odds, but desperately need each other for an upcoming war. Ekko is dead set on protecting Zaun in its class war against Piltover, Shurima is just full of people at each other's throats, and there are power struggles afoot in Noxus. Some of these heroes are kind and good hearted, real heroes at their heart. A perfect example is the Heart of the Mountain. Braum will banter with his Freljordian allies, and they just silently listen to him. It’s a part of the world that has yet to be built, and stands there, hollow. What are their relationships like? The answer, based on existing content, is just “there”. This matters for storytelling. Have you ever watched the Star Wars prequels and wondered why everyone seems so plastic? Part of it is the story’s insistence on love being forbidden and distant. (Okay, the dialogue doesn’t help.) If you want a fully fleshed out world of characters, they need to build bonds. The Wall in Game of Thrones is an incredible fantasy setting with loads of battles, but it would be a sad, lonely, boring little place if it weren’t for Jon’s friendship with Sam and the other recruits. The stories we share from Dungeons and Dragons aren’t the ones where we kill lots of monsters or win a big war, it’s the moments with our party members that made the relationships special. The fans love stories about champions teaming up or going on adventures, but there’s very little to go on. Caitlyn and Vi work together, sure, and Graves and Twisted Fate have teamed up. Kennen, Akali, and Shen all work together... and Zed has become an unlikely ally in the fight against Zed. There are a few stories, but there’s mostly just potential. There’s a whole host of Demacian officers. How do Quinn, Fiora, and Garen all interact in a room with Shyvana and Jarvan IV? We don’t really know. How do Cassiopeia and Katarina talk, especially after Cassiopeia’s little Shuriman incident? We’re not sure. How do they feel about Talon, their missing father’s loyal assassin? The people want to know more about the way the world interacts. Every champion AMA by the devs usually has a few questions: How does Syndra feel about Annie? How does Camille feel about Vi’s primitive hextech augments? Why does Shen treat Akali like an innocent soul in the Jhin story? Riot have been working so hard at creating the broad strokes of the universes, painting kingdoms and wars and alliances and power struggles, that they’ve forgotten that the true beauty of a universe can be in the little strokes of detail that make up characters. There are a couple of exceptions to this rule that I want to highlight, because they break the trend of favouring big worldbuilding plots over little character moments. The first is the conclusion of Burning Tides. Graves and Twisted Fate get the band back together. They admit that they were both wrong in their own ways, they were both stubborn, and they get back to the life of criming it up. It’s a fun dynamic that works because the characters know each other so well and act in incredibly human ways. The second one is Lullabye, an Ekko story. Lullabye doesn’t have any big action set pieces, there’s no world changing scopes, the story is small and intimate and deals with very real issues. It’s small, and beautiful, and a wonderful breath of fresh air in a crowded world where everyone is vowing to kill each other. Lullabye is a story worth returning to again and again, whereas the other stories tend to be setting up some big conflict or showing off how rad a character’s combat skills are. It’s a fantastic piece and it gives me hope that Riot can write characters who interact in meaningful ways. Sure, most people who play League are interested in getting the gold for that BF sword or getting more LP in ranked. Some people, however, are interested in the world and characters of League. It’s just a shame that we don’t get to see them being, well, characters more. As the League Universe continues to expand, I hope we see more of these stories that make a fantasy universe worth living in.